Sunspots are caused by UV DNA damage to the skin. 40 to 60 % of Australians over the age of 40years have sunspots. They may appear as red scaling lesions in sun exposed skin. Often they flare and become itchy in summer. Untreated these may go onto become squamous cell carcinoma. As such they are regarded as pre-cancerous lesions and should be treated. Sunspots are a sign of significant sun exposure and the presence of these should prompt a full skin examination. used to treat individual lesions. 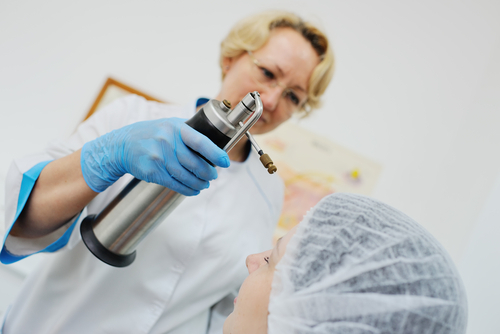 Liquid nitrogen freezes the superficial skin destroying the abnormal skin cells. If you have a large number of sunspots on the face it is likely you will develop more sunspots in other areas. In this case “field treatment” may be recommended. This simply this means treating a large area eg. Entire face, scalp or both with a treatment aiming to treat visible and invisible (developing) sunspots. Your Dermatologist can discuss the options available to help you to chose the one that best suits you. Before “Field treatment” there are a number of considerations. Full skin examination is essential. Sunspots are a sign of sun damage and increased risk of skin cancer. Sunspots and squamous cell carcinomas can look similar. A biopsy may be needed to exclude skin cancer as topical treatments may not be effective. There are a large number of choices available for sunspots, see below for more information about individual “field treatment” options. Your clinician will discuss what to expect and show photos. each treatment has different expected treatment effects. You should be aware of these before starting treatment. No field treatments remove 100% of sunspots. Most treatments achieve approximately 70% reduction in spots at best. Take photos of the field pre , during and post treatment. We will take pre and post treatment photos to document sunspots and response to treatment. Review during and after the treatment. Reassess lesions that fail to clear. After completion of “field treatment” the area should be reexamined 6-12weeks later. Any residual areas can be treated or in some cases biopsied to exclude skin cancer. After field treatment your Dermatologist may recommend a combination of topical retinoid cream (applied at night) and Sunscreen during the day. Discuss this further with your dermatologist.